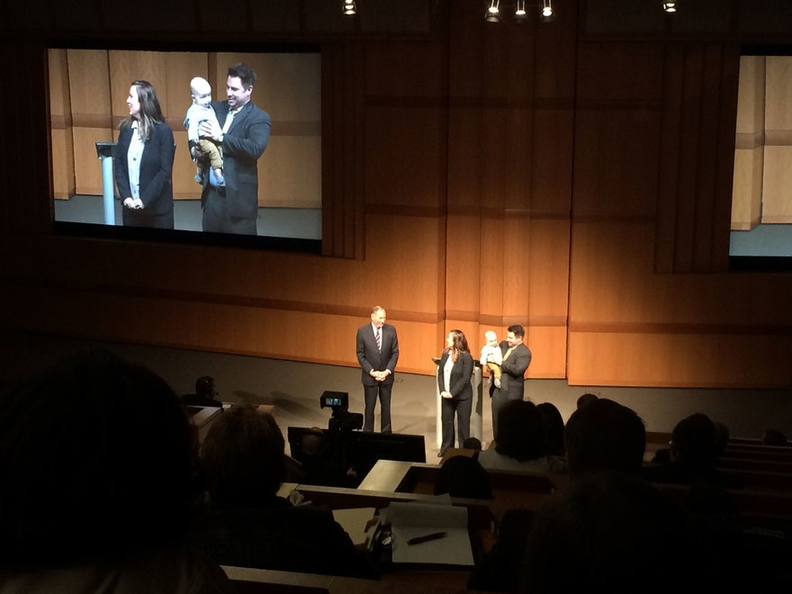 Cleveland Clinic CEO Dr. Toby Cosgrove, left, greets a family that was featured in a patient video at the annual State of the Clinic address on Wednesday, Feb. 24. Cleveland Clinic CEO Dr. Toby Cosgrove credits "the best financial year that the Cleveland Clinic has ever had" to reduced costs and increases in volume and efficiency, he told the crowded room at his annual State of the Clinic address on Wednesday. In 2015, the Clinic earned $481 million in operating income, a 3% increase over the previous year, on $7.2 billion in operating revenue, which was up 7% from 2014. Had the Clinic not reduced the cost of providing care by $604 million over the last three years, 2015 would have been one of its worst financial years, Cosgrove said. "This financial success has allowed us to reinvest in our future," he said, noting that we'll be hearing about some new clinical programs "in the very near future." Cosgrove highlighted two programs that have helped reduce costs: Care Paths and My Two Cents. Through Care Paths, the Clinic has put together 125 guides and 37 pilots to increase efficiencies in treating certain conditions. For instance, Care Paths helped reduce the cost of total knee replacement by 16% between 2013 and 2015, dropping from $3,600 to $3,000. My Two Cents invites employee suggestions for efficiencies. According to the Clinic, 1,053 received ideas have resulted in $7.3 million in savings. In the results of its annual caregiver survey, the Clinic saw "an unreasonable amount of stress" in caregivers, Cosgrove said. According to the results, 42% of caregivers and 53% of physicians reported feeling unreasonable stress. He is concerned about the factors causing this, which he said fall into three main categories: new technology, the explosion of knowledge and health care reform. The rollout of federal requirements for the use of electronic health records are causing frustrations, and physicians are communicating more and more through technology, with millions of messages from patients coming through MyChart, the online patient portal. With ongoing scientific discoveries, there's a lot of information for providers to keep up with — 43,000 journals publish more than 800,000 articles each year. And health care reform means reporting more than 100 metrics to the federal government, and can leave providers worried about staffing and resources as they keep up with all of this. Cosgrove said he will look to reduce stress through staffing and support, compensation, communication and technology that can ease some of the workload. He reviewed what the Clinic has already done, from hiring 500 nurses last year to increasing the minimum wage to $12 an hour. "We plan to put together town hall meetings where we can hear your suggestions and your input, and we will listen and then develop an action plan," Cosgrove said. "This is a major concern for the entire organization, and it's not just us. It's across all health care delivery." Cosgrove touched on the three key parts of the Affordable Care Act: access, quality and affordability. He cited a Clinic hospital in Avon and the cancer center on its main campus — both under construction and expected to be completed by the end of the year — as examples of this increased access, as well as the Clinic's full ownership of the Akron General Health System, a transaction completed last fall. He touted various quality metrics that are meeting or trending toward goals. • Cleveland Clinic Abu Dhabi was formally dedicated last year and is already active with more than 53,000 outpatient visits and 3,000 surgeries and patients coming from 34 different countries. Despite concerns that this might reduce the number of international patients coming to the Cleveland location, the Clinic saw a 6% increase in unique international patients last year. • Also completed in 2015 was the 60-bed Select Medical Rehabilitation Hospital in Avon, an expansion of the Lutheran Hospital Emergency Department and a 155,000-square-foot outpatient facility for cancer and neurology in Florida. • The Clinic's research funding totaled $251 million in 2015, a 2% decline from the prior year. It saw research activity increase by 5% to 2,200 projects. • The Clinic continues to focus on education. It has 1,900 residents and fellows in training, making its residency program the third largest in the United States. The Clinic also broke ground last year on the Health Education Campus, in partnership with Case Western Reserve University. It should be finished in a few years, Cosgrove said. A crowd of a couple dozen Lakewood Hospital supporters protested in the rain outside the Intercontinental Hotel on the Clinic's main campus, where Cosgrove delivered his approximately 45-minute speech. Kevin Young, spokesman for the Save Lakewood Hospital Committee, said his group's message is getting out there. Hospital supporters adamantly oppose a decision to close Lakewood Hospital and shift health care to a $34 million facility to be built by the Clinic. The Lakewood City Council unanimously approved this move at the end of December. Since then, the Save Lakewood Hospital Committee circulated a petition to repeal the ordinance. Young and other supporters criticized the move for its lack of open bidding process, the loss of an economic driver in the city and the loss of in-patient care. The issue is headed for the ballot this year in August or in November, he said. Lakewood didn't place it on the March ballot, despite the group collecting enough signatures to do so. Cosgrove touched only briefly on Lakewood Hospital, which ended in-patient services earlier this month. "I'm happy to say that when this in-patient facility closed, we were able to offer jobs to all of the individuals and so no one lost their jobs because of that closure," Cosgrove said. Young said those jobs have left the city limits of Lakewood and that he is concerned about the ripple effects that could have on other businesses in the city. "Cleveland Clinic CEO reports 2015 was best financial year in the health system's history" originally appeared on the Crain's Cleveland Business website.